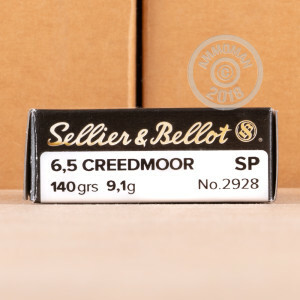 This 6.5 Creedmoor cartridge by Sellier & Bellot features a 140 grain projectile. 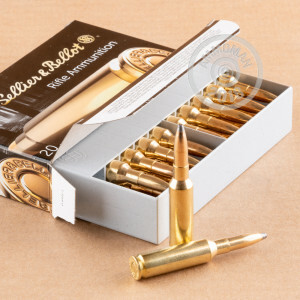 The bullet’s partial jacket is made of CuZn 10, a copper-zinc alloy known for its exceptional ability to withstand the effects stress corrosion, which helps the bullet to resist deformation until it has adequately penetrated a target’s hide. Once within, the bullet’s exposed soft lead core deforms to cause substantial expansion in order to create an exceptionally wide wound channel. Along with this round’s supersonic 2,657 fps muzzle velocity, it provides the kind of stopping power you need to drop even the brawniest bucks right where they stand. Sellier & Bellot is the world’s oldest operational ammunition producer -- they were founded all the way back when percussion cap guns were the norm. They’ve kept abreast of the latest trends in technology, however, and today the Czech manufacturer’s products are respected by various types of shooters all around the world for their reliable performance.